BALTIMORE, July 17, 2015 – Pride of Baltimore II, America’s Star-Spangled Ambassador, will serve as the Committee Start Boat for the oldest and longest overnight race on the Chesapeake Bay. 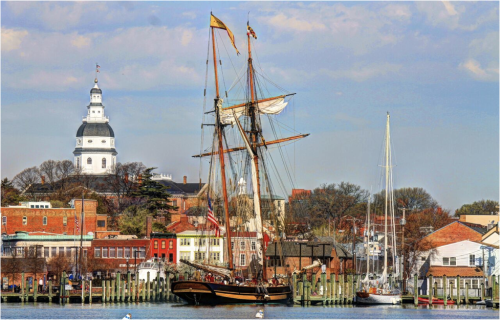 The 42nd Annual Governor’s Cup Yacht Race will be held July 31 and August 1, 2015 and will depart from Annapolis, the current seat of government, heading 70 miles south to St. Mary’s City, the state’s original, pre-Revolutionary capital. As the Committee Start Boat, Pride will occupy one end of the starting line. Officials on board will go through the starting sequence and officially begin the race. Members of the press are welcome to capture the race’s exhilarating start from aboard Pride. To RSVP, contact Laura Rodini at laura@pride2.org or 202-669-3065 (cell). Pride will offer free deck tours beginning at 10 am on Saturday, August 1 and Sunday, August 2 before returning to Baltimore on Monday, August 3. Pride‘s 2015 sailing season will run through October. Visitors will have the opportunity to participate in the unique and historical experience of stepping aboard a topsail schooner through our interpretive dockside tours, as well as day sails and overnight guest crew opportunities. Pride is also available to be chartered for private day sails of up to 35 people as well as dockside receptions for 100; Contact our office for details. For a complete schedule of Pride’s activities, visit www.pride2.org. To learn more about the Governor’s Cup, click here. For nearly four decades, the Pride of Baltimore and the Pride of Baltimore II have represented the people of Baltimore, spreading a positive message and extending the hand of friendship throughout the world. Since her commissioning in 1988, Pride II has traveled more than 250,000 nautical miles and visited 40 countries in 200 ports. Pride II has become one of the most well-known U.S. sailing vessels in the world, capturing the imagination of millions of people. SAIL MAIL: Celebrate July With Pride! Celebrate Independence Day with America’s Star-Spangled Ambassador, Pride of Baltimore! After a successful visit to Philadelphia as part of the Tall Ships Philadelphia Camden festival, Pride has returned to Baltimore, just in time for Independence Day weekend! Pride will be at the Inner Harbor on Friday July 3rd. As part of our free deck tour program, generously sponsored by Exelon Corp, you have the opportunity to explore the ship, learn about past and present life aboard schooner privateers, and interact with our passionate and knowledgeable crew. We will also feature day sails in the afternoon and in the evening. On July 4th and July 5, Pride will be docked at the pier at Fort McHenry National Monument and Historic Shrine. There will be a lot of excitement at the Fort all weekend long, with Ranger-led talks throughout the day and interactive events that allow you to raise the stars and stripes, all while learning its important history. Pride will also offer a day sail on Saturday afternoon. How many times can you say you saw Fort McHenry just like Francis Scott Key did during the War of 1812, from aboard a tall ship on the Patapsco River?! Also on July 4th, you’ll have a special opportunity to see the fireworks from one of the best locations in the Inner Harbor – aboard Pride of Baltimore herself! Pride is offering a limited number of guests the unique perspective of watching the fireworks from a location on the water, between Fells Point and Tide Point. On Sunday, July 5, Pride will again be at Fort McHenry, offering free deck tours. There will be a Tattoo Ceremony with the US Army Old Guard, patriotic music and pageantry at 2pm. For parking and other Fort McHenry Visitor information, click here. Pride is looking for a few good volunteers to assist with the Fourth of July weekend festivities. Duties include welcoming guests aboard Pride, handing out information to visitors and other duties on board the ship. Any and all help is appreciated. If you are interested, fill out our Volunteer Form! Take a Private Charter Aboard Pride! Staff appreciation, networking events, leadership/teambuilding experiences, family reunions, birthday parties… Endless possibilities! Pride of Baltimore provides an exclusive way to entertain clients, customers, employees, or friends. The vessel’s sleek hull, raked masts, and intricate rigging provide a dramatic setting for any occasion. The vessel can be chartered for a sailing or dockside reception at any of her ports-of-call. Pride, Inc. staff and crew will work with you to make your event truly unique – leaving an unforgettable impression on your guests. Per U.S. Coast Guard regulations, the number of guests for a dockside reception is limited to 100 on the vessel; more if shore facilities are available. Sailing charters can accommodate 33 guests. Contact us to learn more. Over the years, Pride has voyaged to ports around the world in order to participate in festivals and other War of 1812 Bicentennial events. But this year, Pride’s main focus is Baltimore. Pride is thrilled to celebrate her rich heritage with the citizens of her namesake town, which is why will be docked in Baltimore throughout the summer! Come and join us! The British were impressed with the sailing abilities of French frigates of Hermione‘s design, and when they captured her sister ship Concorde, they brought her back to England, carefully measured her, and saved her “lines”. Thirty years later the Baltimore Clipper design was outsailing anything in the Royal Navy, and when the Baltimore letter-of-marque schooner Lynx was captured in 1813, they again saved her design details. Original shipyard construction plans were lost in both cases, so reconstruction efforts relied on our common enemy who kept good records. This month, in lieu of a Trivia question, we invite you to step away from your computers – and join us in Baltimore, at the Inner Harbor and Fort McHenry! Executive Director, Pride of Baltimore, Inc.